UPF Japan (Tokyo, Japan -November 18, 2014 ) – UPF Japan organized the fourth Japan-Europe Leadership Forum on Nov. 18, 2014, at the Parliamentarians Hall in Tokyo. This time Dr. Willem Frederic van Eekelen, former defense minister of the Netherlands and secretary general of the Western European Union, was its keynote speaker. Based on his half-a-century long expertise on Europe’s security, Dr. Eekelen called upon Japanese leaders to find ways and means of making peaceful collaboration with South Korea. In his lecture, he frequently referred to Germany’s endeavors after World War Two, first reconciling with the rest of Europe, then building a genuinely democratic West Germany, and finally unifying with former communist East Germany. About one hundred leading figures including members of the Diet, Japanese and foreign diplomats, scholars as well as some Ambassadors for Peace attended. Referring to the ominous Middle East situations including the Islamic State, Dr. Eekelen highly praised the UPF’s project for peace in the Middle East, especially through reconciliation and enhancing cooperation among people of the major religions. Once under German occupation, Dr. Eekelen described how he could overcome past aversions, if not hostilities, to German people, when he studied in an American university with people of many nationalities including Germans and Japanese. Against the backdrop of increasingly inward-looking Japanese youth, Dr. Eekelen urged Japanese leaders to facilitate overseas experiences for younger generations. He said that a good understanding of one’s counterparts, allies or foes, will be very vital for Japan’s security and aspirations for peace. This forum was initiated by Dr. Yong Cheon Song, regional chair of UPF-Japan, after he took up the leadership in Japan about two years ago. As Japan faces difficult challenges, domestic or international, he harbors hopes to bring some worthy ideas and experiences to Japanese leaders from Europe where he had directed the UPF for a decade. Dr. Eekelen, as one of ardent Ambassadors for Peace, used to help UPF-Europe organize numerous public events together with Dr. Song. In Dr. Eekelen’s six-day tour in the western part of Japan, similar lectures were given in Nagoya, Fukuoka and another in Tokyo to the total of 1,100 people. Many of them appreciated the rare opportunity to listen to and converse directly with a leading figure from Europe. 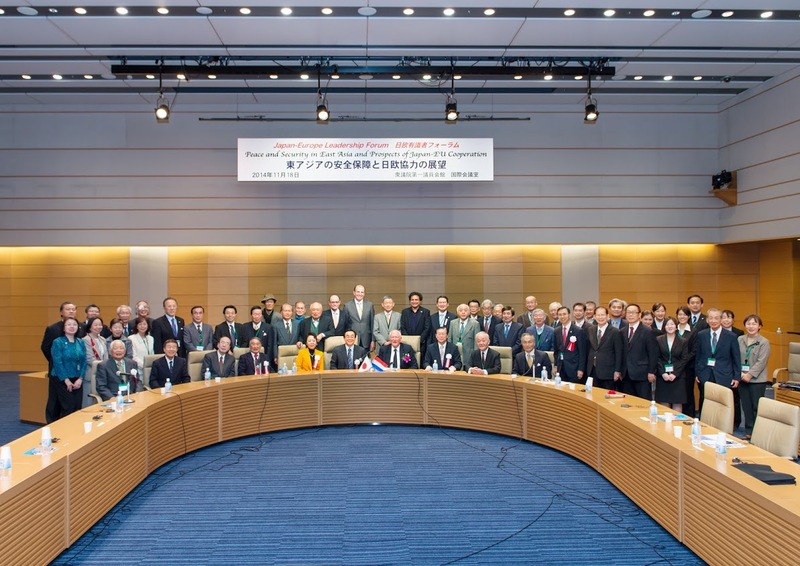 Tokyo, Japan – UPF-Japan organized the fourth Japan-Europe Leadership Forum on Nov. 18, 2014, at the Parliamentarians Hall in Tokyo. This time Dr. Willem Frederic van Eekelen, former defense minister of the Netherlands and secretary general of the Western European Union, was its keynote speaker.